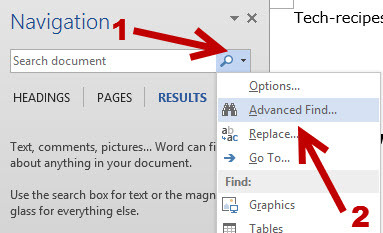 Even though the basic Find and Replace function in Microsoft Word is helpful for finding words that match a search term, it may not be the ideal tool if you want to search for individual words or large portions of text that have the same format. Luckily, you can expand the function of Find and Replace to add filters to the search such as font style or color and receive the results in no time. 1. Launch Word, and open the document you want to edit. 2. Once the file is loaded, press Ctrl + F to open the Navigation panel, click on the arrow next to the magnifying glass, and choose Advanced Find…. 3. When the Find and Replace window appears onscreen, it should be displayed in basic mode, which only allows you to find words inside the document without any other filter. In order to switch to the advanced mode, click More. To add the font filter to the search, click Format -> Font. 4. In the new Find Font window, use the Font drop-down menu to choose the desired font. You can use other font filters such as font style, size, or color to narrow down the result list. 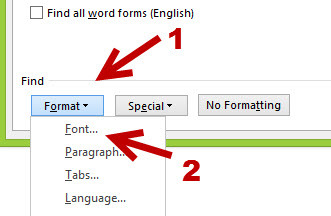 These additional options are helpful when you use the same font with different styles for many parts in the document. After you add all the necessary filters, click OK to return the filters to the main Find and Replace option. 5. Now, you should notice an extra format filter under the search box. If you want to search for all texts in the chosen format, leave the search box empty, and click Find Next. You can also switch to the Replace tab and swap the matched result for a new word as you typically would using the basic Find and Replace feature. To highlight all the results, click Reading Highlight -> Highlight All, and close the search window.